Godetevi la vostra vacanza nella bellissima isola di Cefalonia - Poros - "Dionysos"! Dionysos in un bello regolando trascuranze de marina con le viste fantastiche del mare. We stayed at Dionysos for 6 weeks last summer (2005) and had a superb time both in Kef and in particular at Dionysos. The accommodation was perfect, the rooms were light, clean, and tidy and the staff were great. We had a great room with a terrific view of the bay and port area from our balcony. I note others have mentioned they could hear the ferries coming in and out of the port in the morning, I can say that throughout our 6 week stay, we did not notice any such noise and the double glazing did a great job not only by keeping any noise out but also by keeping the rooms very cool, along with the air con which was stunningly good! Greg was particularly helpful and really looked after us. We suffered a puncture to our tyre midway through the holiday and really didn't know what to do. We hitched a ride back into town to Dionysos to ask advice, and Greg really put himself out by giving up his siesta, driving us back to the car and by helping us sort it out! The guy was a legend throughout the duration of our stay. The Dionysos represents real value too, I will definitly be going back and staying with the team! 7 visits to poros , our first at dionysos. we will definatly be back next year! we arrived very late at night, gregory thought we weren't coming til the following night due to a fault on his computer. we had to knock him out of bed. i felt really sorry for him but he offered to cook us a meal which we refused being 1 o clock in the morning! he came back with a couple of ice cold beers on the house which we were very gratefull for! the studios were perfect. some have said they are small but we found them fine. after all, you spend most of your holiday outdoors? they are spotless, cleaned every day, fresh towels daily and fresh bed linen 3 times a week. nothing is too much trouble for gregory and his staff. don't forget his taverna is excellent too! combined with the location, i wish i had stayed at dionysos a lot earlier in my annual pilgrimages to poros. i have already got my dates pencilled in for next years visit!! Basic but clean. Calling it an appartment is a bit of a stretch of the imaginaiton. One small fridge, 2 "hotplates" which take about an hour to boil 1/2 pint of water. However, it was clean. Air con would have been better if it went on at 9.00 instead of 10.00 but was good onc eit got going, don't think I could have slept without it. Food was good in the taverna. Had to go and buy a toilet roll one day as the maid din't leave one, seem to be rationed to 2 a week. Location is good on the harbour with something going on most of the time but not too busy. Short walk into town to work up an apetite and plenty of places to eat. If you like quiet this is a great place. If you are looking for action forget it. There is no pool but if you are prepared to walk up the hill you can use the pool at the Oceanis hotel for free. We went up there about 3 days and it was very quiet. stayed at dionysos for 2weeks very clean great food.a bit noisy in the mornings with ferries coming in. Just come back from the Dionysos last Tuesday, we loved it only small rooms but very clean we had a front balcony which was great for watching the ferrys and boats come in. The fridge was not very big but the owner used to let us put ice blocks and ice in his big fridge downstairs. lovely place to eat at as well. The main thing was the air conditioning which was free, it was on from 10pm till 9am next morning, fantastic everyone we new were jealous. If you want any more info leave a message for my e mail. Dont know there e mail sorry. The Dionysos Studios are in a very nice setting above a taverna overlooking the port. The Studios are clean and seem to be hotel rooms converted to apartments by adding a cooking and dish washing unit. The utensils are extemely minimal. There is no kettle, toaster, spatula or bread knife and the cooker only has one large and one tiny ring. The apartments will not suit those with walking difficulty as there is no lift and it is a stiff walk up the hill to the town. Remember to hide a toilet roll because the smiley maid seems to expect you to go without on your last day! There is no real problem with street noise at night although the apartments aren't really adequately sound proofed so at times, you may have to bite the pillow(if your lucky). Oh, if your in a north or east facing apartment watch out for Bobby the bullfrog! Hi Sue, in answer to your question the air con is free. It's a really nice place to stay. 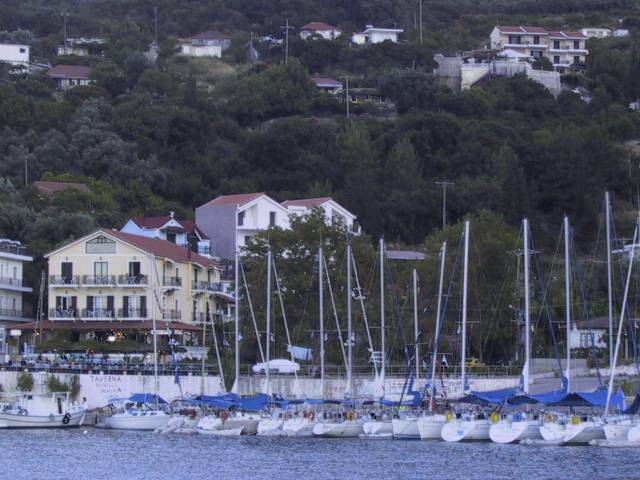 I'm also going back in June, Dionysos was fully booked so we are staying at Poros Bay this time. We visited Poros in June last year. We found the Dionysos Apartments to be very clean and well kept and located in a beautiful setting overlooking the harbour. The Taverna below served excellent food of which you could smell being perpared in the early evening from the balmy setting of our balcony. We had a great time and we are looking to return this year. We stayed at these clean modern apartments in August 2002. Our room was at the front with a balcony on which we sat overlooking the sea and picturesque working harbour. (We will never forget the absolute chaos of the twice daily ferry loading and unloading - entertainment at its best!) Poros is a bit remote so a car is desirable. It is split into three bays each with its own character. The southern being the harbour, the middle being the attractive village and the northern bay being the 'beach holiday'end. Kefalonia is a beautiful island. Full of pretty villages, stunning little harbours, Drogorati caves, Assos, Fiskardo, Agia Efimia and the capital Argostolli well worth a visit so make the effort to get out and explore. Good food, clean, family run, friendly. Happy memories!